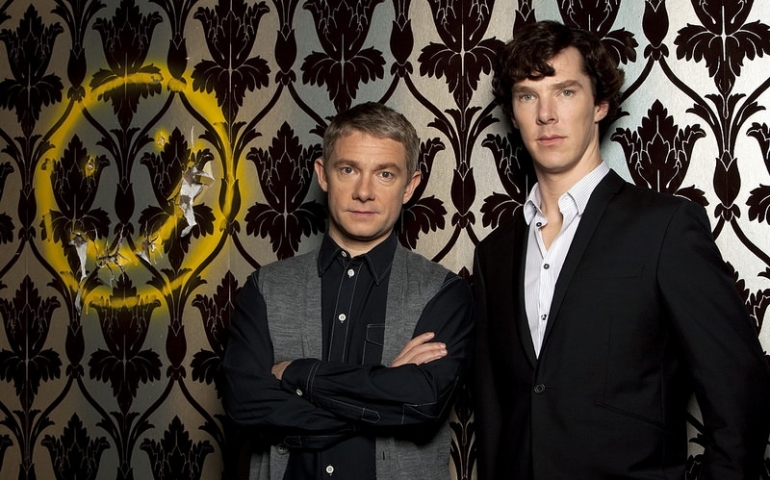 “Sherlock” began airing in 2010 and has three series so far. One would think that that’s a lot of episodes, but it turns out that there are only three episodes per series. Each episode is around an hour and a half long, like a movie. What is unique about this show is that it takes place in present day London, which means that Sherlock is aided by modern technology. Laptops, smartphones, GPS – it’s all there. But even then, the essence of the original stories isn’t lost. Fans of the original stories will catch some references here and there (221 Baker Street, anyone? ), and Sherlock is not without his arrogance and extremely quick wit. He is played by Benedict Cumberbatch. “Cumberbatch manages to play off Sherlock’s strong arrogant demeanor as well as making the character expressive and at times even seem vulnerable,” said Hannah Bean, Sophomore. The show will occasionally give you insights as to what’s going on in Sherlock’s mind. Deductions, thoughts and texts will subtly appear next to whatever’s going on. It can be confusing at first, but as the show goes on, this neat effect turns out to be helpful. Of course, Sherlock is never without his sidekick or adversaries (the villains are great, by the way). This adaptation’s John Watson can certainly hold his own in a case, picking up on things that Sherlock doesn’t always take into account right away. That being said, Sherlock is not without his quirks, and Watson is constantly putting up with him. Aside from the superb acting, the show itself is well-written and well-presented. There are a lot of unexpected twists and complex plots; often what seems to be a simple problem turns out to have another layer. The pacing tends to be fast, and different camera angles and techniques help facilitate the suspense and action. Also, many of the characters, especially Sherlock, have memorable and funny lines and catchphrases. A lot of shows just have one tone or feeling to them: lighthearted, dark, dramatic, etc. While the catch-all term for “Sherlock” might be “suspenseful” or “intense,” it conveys a whole spectrum of emotions. From laugh-out-loud one-liners to tense conflicts to even tear-inducing moments, this show has it all. They’re woven all together, each one hardly out of place. As a music major, I would be remiss if I didn’t mention the soundtrack. I love it. Some of it’s orchestral, some of it sounds more modern, but it matches the visuals perfectly. More often than not it adds to the suspense.